I have not been to every place in the world, who has? But, I have seen a lot of it. Certainly, there are sacred places to various peoples in every country and the land called America is no exception. We have, in this country, many places that shout with beauty and sing to the Artwork of The Creator’s Ultimate Talents. Yet, when I consider these gentle giants of antiquity, I feel a reverence around them, and a need for quiet humility that I have never felt in any spot upon this amazing world we, with such simplicity, call Earth. The majority of the pictures come from a registered and purchased National Geographic program and as such are copyrighted by them. Some pictures and other information comes from other websites and sources, for which are attributed with direct links to the respective sites. For the most part, comments are mine. However, scattered throughout are quotes from one John Muir. It can be safely said that we, of today, have the Big Trees and not only memories passed on about them. Certainly it can be safely said that without this man, and having a President in the White House that at the time loved nature as much as any man, Theodore (Teddy) Roosevelt, we would not have these areas of near virtual wilderness within the confines of “lower 48 states”. - from John of the Mountains: The Unpublished Journals of John Muir edited by Linnie Marsh Wolfe, (Madison: University of Wisconsin Press, 1938, republished 1979, page 439. The beginning of a new camping ground, some 50 years ago. None of Nature's landscapes are ugly so long as they are wild. - Our National Parks, (1901), page 4. The seemingly immortal Sequoias can attain a height of more than 300 feet. This particular specimen, in the center of the picture, has a diameter of 22 feet. 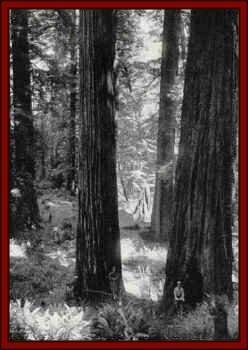 By the 1950’s, these campers were among the estimated 18,000 who had seen the South Calaveras Grove. 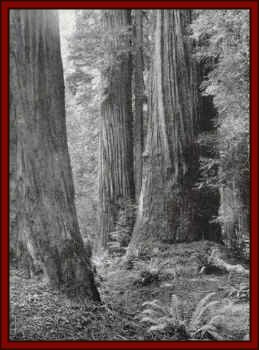 A Sequoia is on the left while the lesser trees are firs. Climb the mountains and get their good tidings. Nature's peace will flow into you as sunshine flows into trees. The winds will blow their own freshness into you, and the storms their energy, while cares will drop off like autumn leaves. -- Our National Parks , 1901, page 56. How majestic this giant must have been before it was cut down in 1853. It is said that it took 5 men 22 days to accomplish the task. It is also said that a bowling alley was laid out on the fallen trunk. 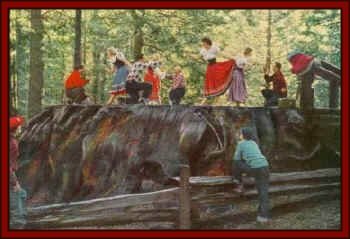 Sections of the bark were shipped east and set up like a living tree to convince unbelievers of the Big Tree’s existence. This picture, again, is from the 40/50’s. I find it shameful, somehow, that what remains can not be used with more respect than a “dance floor”. Sunbeams breaking through ground fog mid-morning. 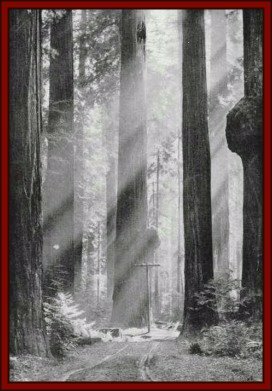 Sometimes the forests are so wet that the dripping of water from the high crowns is like a spring rain.Sunbeams breaking through ground fog mid-morning. Sometimes the forests are so wet that the dripping of water from the high crowns is like a spring rain. 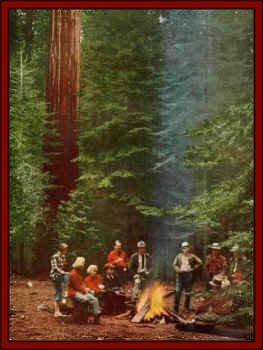 - The Yosemite (1912), page 256. What a fantasy land nature can make. If you don’t think these trees are giants, take a closer look at the picture – that is a full size telephone pole in the center of the picture. 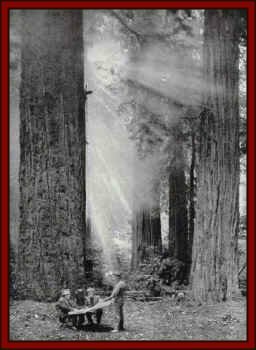 This shot was taken probably in the 40’s or later, near Dyerville, California.